Years back Jim Carrey was and autism were mentioned together regularly in the news. This was at the height of the vaccine misinformation campaign of his then partner, Jenny McCarthy. Mr. Carrey went so far as to be a speaker at the “Green Our Vaccines” rally in Washington. That was 2008. Since then the Green Our Vaccines as a movement has died, Jenny McCarthy has tried to distance herself from her very vocal stance on vaccines, and given that Mr. Carrey and Ms. McCarthy split, it seemed like we had seen the last of Mr. Carrey. You see Mr. Carrey took offense to new legislation in California. A bill that will roll back vaccine exemptions to where personal belief exemptions will no longer be accepted in the schools here. In other words, for the most part one will now need an actual medical reason to avoid vaccination in order to register for public school. And Time Magazine in Jim Carrey Apologizes for Using Photo of Autistic Boy in Anti-Vaccination Tweet. Because, to give him credit, Mr. Carrey did apologize to that family. (Ironically, it turns out that the kid was unvaccinated when he was first diagnosed autistic). So while I do appreciate Mr. Carrey stepping up and apologizing to one family, I do want to point out: Mr. Carrey, you were one of the problems for the autism community. And you apparently still are. Ms. McCarthy introduced you to a closed group of people, a small sampling of the autism community. You likely came away thinking that they *are* the autism community, because that’s how they think of themselves. Most of us autism parents don’t subscribe to the vaccine causation idea. I can provide the links to multiple studies if you like, but it’s just the way things are. And autism parents are not the autism community. One thing that Generation Rescue and like organizations have done is act like autistics are some sort of second class citizens in the community. Who do you think the community primarily is, autistics or parents? Here’s the thing: the vaccine-causation idea is probably the most damaging notion to have hit the autism community. Did you hear about the “refrigerator mother” theory during your time at Generation Rescue? 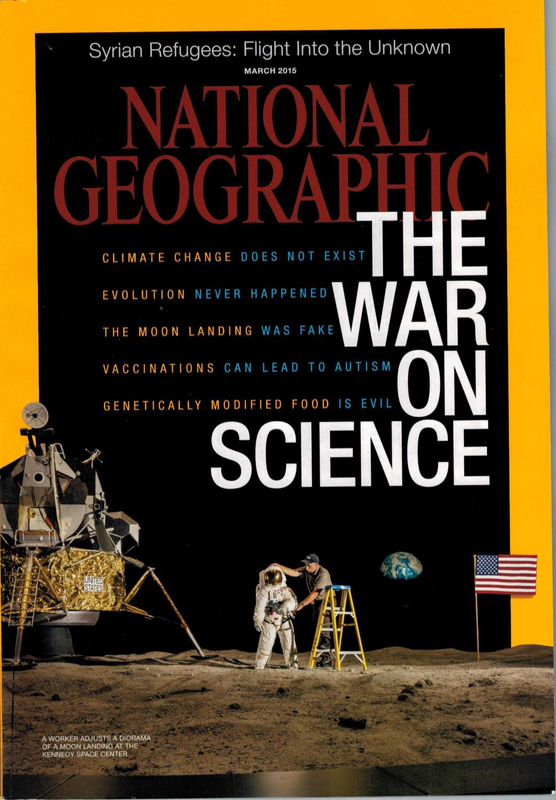 It’s second to the vaccine causation theory. Telling generations of disabled kids that they are less than they are, that they should be someone else, is damaging. Mr. Carrey, did you attend any of those parent conventions, like AutismOne? Perhaps you look at alternative medicine favorably. Well, the vaccine causation idea is used to sell “therapies” that aren’t close to being “alternative”. They are just wrong. And, frankly, abusive. Chemical castration of disabled children? This was promoted multiple times at conventions where your former partner was a keynote speaker. Fake diagnoses of mercury poisoning, followed by chelation? Same. And even a major promoter of chelation has a new study showing it doesn’t work. Did anyone tell you why the NIH autism/chelation trial was stopped? Because if you chelate test animals who do not have mercury intoxication, they go down cognitively. If the same happens in humans, tens of thousands of autistic children lost some IQ due to chelation. Think that one over, since GR started out as primarily an org promoting chelation. Daily bleach drinks and bleach enemas? That one is probably new since you dropped out. But, yep, that gets sold as a cure for “vaccine injury”. Shall I go on? Because I can. The autism=vaccine injury idea sells junk medicine which is subjected upon disabled children. And you added your voice to the vaccine-causation idea. You’ve apologized to one family. That took guts. Now step up and start making amends to the rest of us. Parents and, especially, autistics. CNN Money has a short video up that makes a point that a few of us have been making for the past few years: much of the vaccine antagonistic message is funded by a few wealthy people. A good discussion can be found at A Snapshot of the Deep Pockets of the Anti-Vaccine Movement on Haprocrates Speaks. The CNN piece is called “The money behind the vaccine skeptics“. I can’t get the video to embed here, but one can find it here. 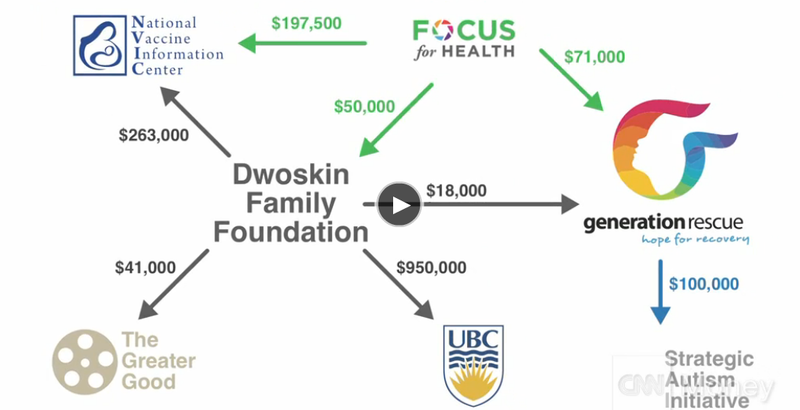 CNN points out that the self-styled National Vaccine Information Center and others (such as Chris Shaw’s group at the University of British Columbia) get a lot of money from the Dwoskin family. The Dwoskin Family Foundation told CNN that they are not antivaccine but are, instead, advocates for safer vaccines. It’s a story we hear a lot. I’m not sure how that sentiment fits in with being “advocates for safer vaccines”. One has to accept that vaccines are safe before advocating for safer vaccines. Also mentioned is Barry Segal who funds Focus Autism (now Focus for Health) and A Shot of Truth. And Generation Rescue’s JB Handley and Jenny McCarthy. 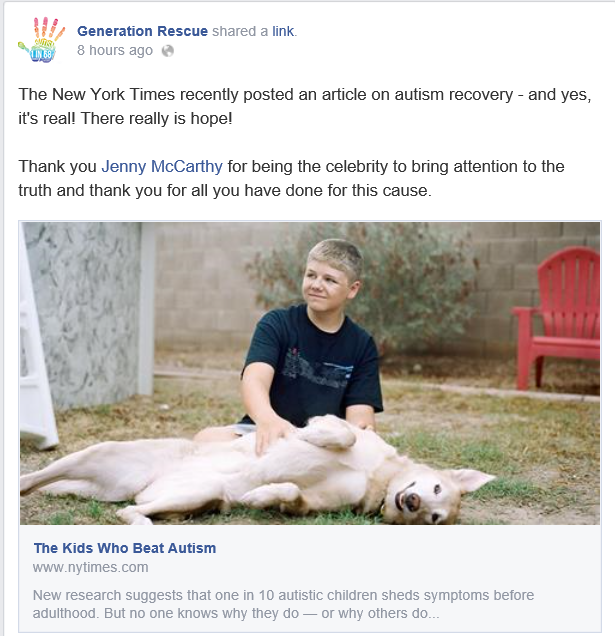 Both Focus Autism and Generation Rescue are noted for funding Andrew Wakefield’s “Strategic Autism Initiative”. All these groups are discussed in previous articles here at Left Brain/Right Brain. The piece is short and perhaps that’s why they don’t mention Generation Rescue’s hundreds of thousands of dollars spent on full page ads claiming vaccines cause autism, or their poorly performed phone survey on vaccines. Lots of money spent on promoting fear and distrust of vaccines. The show is filled with such heart-to-hearts, with McCarthy recounting her ordeals as a single mom, starting with her ex filing for divorce in 2005 the same week that Evan was diagnosed with autism. Now, it’s been a while since I read Jenny McCarthy’s “Louder than words” book. A long while, but that statement didn’t strike me as consistent with what she wrote in her book. The sentiment is the same: harsh on her kid’s father while putting herself in a good light, but the details didn’t match. What did she say in her 2007 book? She says that she asked for the divorce. She was the mommy warrior, taking charge in that book. Now in her reality show she’s the object of sympathy, dumped by her husband just when she needed him most. 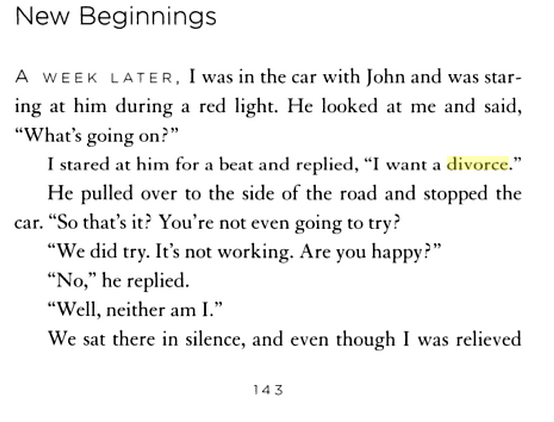 In fact, if you read the book, she talks about thinking about divorce for some time before she finally asked for it. Because that whole “same week as the diagnosis” thing in the TV show isn’t what she wrote in 2007 either. Between the autism diagnosis and her asking for a divorce, there are weeks, if not months of stories in her book. Stories that include Ms. McCarthy asking her husband to leave, and him refusing. Who knows what the actual story was. All we hear is the story that fits the image she wants to portray at the moment. Her ex husband is taking the high road and not returning fire. Oh, and if you are worried about how her son took the divorce, don’t. According to Ms. McCarthy, autism renders one incapable “emotionally connecting” with such events. Sorry to be sarcastic there. But, really, Ms. McCarthy? Autism renders one incapable of emotionally connecting with what was going on? Couldn’t be that the kid was unable to understand why his mother was making his father leave, just as any kid would? No real surprises here. Ms. McCarthy has been inconsistent over the years. She had multiple stories of her first encounter with Barbara Walters when Ms. McCarthy was a guest on The View. She has informed us that her son is no longer autistic. Then, a few years later, she tells us that he is. (Jenny McCarthy Slams Rumor That Her 11-Year-Old Son Evan Doesn’t Have Autism). She hammers away at vaccines, but tells us she’s pro-vaccine. And to cap it all, she heads an autism charity that focuses on treatment, but won’t speak out against the faux treatments (like bleach enemas) that are promoted at her orgs conventions. Jenny McCarthy is back in the news. It appears that The View is not renewing her contract. In fact, there seems to be quite a shakeup at The View with many people leaving. Jenny McCarthy is responding to this news, discussing fellow View host Sherri Shephard as picked up by Fox News. Interesting spin there–instead of being released, she’s framing it as Jenny McCarthy, ready to take a stand and quit her job for her “sister”. Right. One thing I’ve learned over the years watching Jenny McCarthy, she’s good at spinning things to make herself look good. She’s been a bit of a chameleon when it comes to her opinions. When it comes to autism, she started out with a new-age type “indigo child” approach. Then she took on the “vaccines cause autism” thing, which really catapulted her back into the public eye. Then the vaccine thing became a liability and she got quiet, finally posting an op-ed distancing herself from her previous views*. And, now, we see that the “View” she’s had for the past year was, well, just for “The View”. New job, new View. Will that involve autism, vaccines or something new? We don’t know. We just know that leaving the show means she can change her views. I don’t know if that’s true or not. I know she fueled a movement away from vaccines. For example, she wrote on Oprah Winfrey’s website in 2007, “But if I had another child, I would not vaccinate.” Yep, she has technical truth. She didn’t say, “you don’t vaccinate”. She just put herself out there as a leader of a community and said, “I won’t vaccinate”. You know what word you won’t find in her Op-Ed? Autism. She doesn’t even approach the question that made her famous and that put so much fear in parents. It’s a very politically crafted article, in my opinion. We’re scared. I mean moms and pregnant women are coming up to me on the street going, I don’t know what to do. I don’t know what to do. And I don’t know what to tell them, because I am surely not going to tell anyone to vaccinate. But if I had another child, there’s no way in hell. She won’t tell someone *not* to vaccinate, but she “surely” won’t tell some one to vaccinate. Right. She gives people incorrect information about the safety of vaccines, they get scared and don’t vaccinate, but it’s not her fault because she’s on record saying (but not acting) she’s pro vaccine. MCCARTHY: We get that they’re saving lives, but the increase is ridiculous, you guys. Look, it’s plain and simple. It’s bull (EXPLETIVE DELETED). MCCARTHY: My son died in front of me due to a vaccine injury. And there are many — every week I get a picture of a dead child. What are parents supposed to think when they hear her say that vaccines kill, and that there are “too many, too soon”? Seriously, if there are “too many” vaccines, are parents supposed to say, “Jenny McCarthy is pro-vaccine. I’ll vaccinate my kid!” Too many means some vaccines shouldn’t be given which means, don’t vaccinate with those vaccines. But, Jenny McCarthy doesn’t want you to think that’s what she said.